I’m one of those people who are always cold, especially my hand and feet. Slipper and wool socks take care of my feet, but I can’t spend the whole day in mittens. 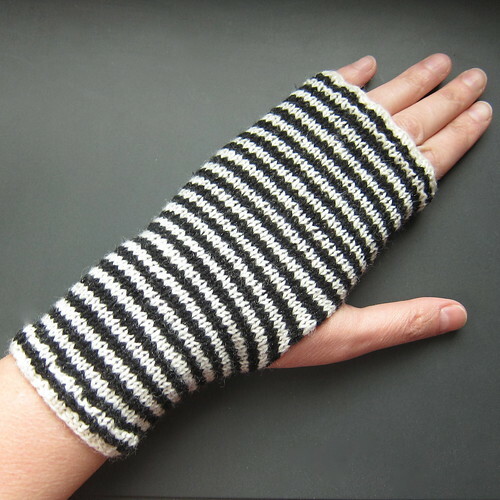 That is where handwarmers come in, they still allow me to do things like knit and type while keeping my hands and wrists warm. 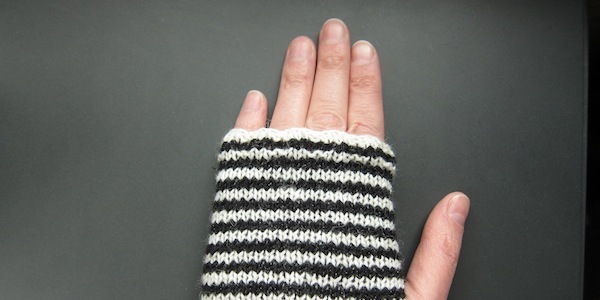 This pair was made to match the Breton Stripe Cap I made for the last Iron Craft challenge. I love the look of the stripes with that little bit of shine in the black. 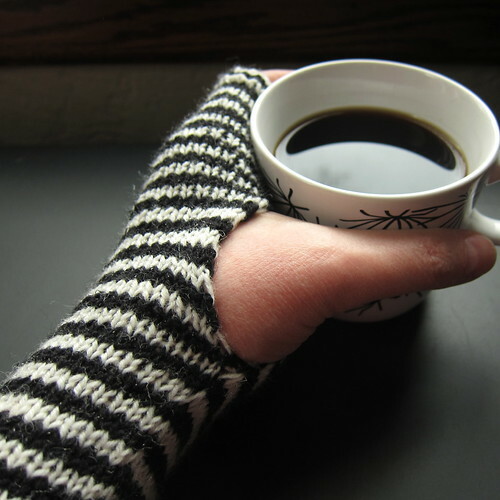 Other than the stripes, these are pretty darn easy to whip up and can be done in no time. I kept them pretty short since I wear them with long sleeves, but you can make them as long as you want. For this pattern you will be working stripes in the round which can cause a step or jog when you switch colors. See my directions on how to do a stepless stripe here. You will be starting at the top of the warmers and working down. Cast on 44 stitches with ecru or white yarn. Divide between 3 needles. Join to knit in the round being careful not to twist the stitches. Place a stitch marker between the first and last stitch to mark rounds. Row 7 – 32 (or desired length): knit switch color every two rows. 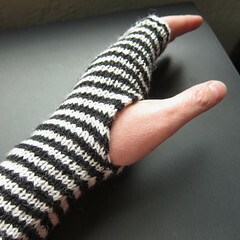 To make the thumbhole you will knit flat instead of in the round, which will leave an opening where the thumb goes. You can leave the stitches on the double-pointed needles while doing this. Keep your stripe pattern going throughout. Now you will go back to knitting in the round. Bind off in ribbing pattern. Weave in ends. Wow. i really like the stripes. These are fantastic! I need these for working on my computer right now! My hands are freezing! Hi. I just started this wonderful pattern, and i’m up to row 33 now, i really don’t understand how to continue from there. how to turn the work and knit flat while the stitches are still like that? can you link me to something that shows me how to do that?